Don’t think you can deep-clean in winter? Think again. There are two inherent logical fallacies to the concept of Spring-Cleaning. It’s the best time of the year, with so much to do, and so many places to see. Do you really want to spend that time, tracking down dust-bunnies in your attic. The Technicians at Naps Maintenance, experts at Residential Cleaning services, recommend these simple tips to help you get started with your winter cleaning. Vacuuming the insides of the furnace can get rid of those pesky dust bunnies running around the place. Removing Dust and Grime by scrubbing them out will also give it an instant makeover. Changing furnace filters periodically alone can slash your fuel bills, making your home more energy-efficient while keeping the air, fresh and breathable. Naps Maintenance, experts at residential cleaning services, can help you fix your furnace filters, so that it stays neat for an extended period of time. In winters, salt tends to get collected in between the carpets and floor, and when it dries out it leaves an off-white film that looks quite deplorable. Steam cleaning can help you get this pesky film, off. Professional residential cleaning services can help you with your carpet cleaning needs. Naps Maintenance services use a new method called forced hot water extraction because it leaves no residue (that’s the stuff that reactivates when your carpet dries, so the stains only fade, never go away completely—yuck!) And don’t forget to keep those snow boots in a separate box by the entrance, so that salt water doesn’t get all over the place. Since the air is quite warm and dry in the winters, dust tends to get settled everywhere, making your home extra dusty. The tops of bookshelves, ceiling fan blades, etc. are places that collect dust and get grimy. Pay special attention to these places. Light fixtures can collect a film of dust and that can make them quite opaque, making your entire home look shadowy. Let the light through by polishing up those light fixtures. Air ducts attract an insane amount of dust. It would be far more convenient to have it professionally cleaned. This would help reduce the amount of dust, pollen, germs and other pesky allergens circulating in your air. This also helps your furnace run at top efficiency. Cleaning homes from top to bottom can get quickly tiring. 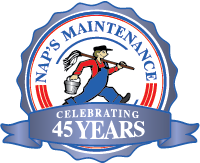 Call Naps Maintenance so all the nooks and corners, the havens of dust and allergens are taken care of for you. Windows are the first line of defense from outside elements and as such may pick up a lot of dust. Soot from burning candles and incenses can also get deposited on the inner surface. All this can act to block out vital sunlight. Giving the windows, a good wipe-down during the winter months can help you get precious little sunlight into your house. Naps Maintenance can take your window cleaning game up a notch. Call Naps to get your windows sparkling like new again. 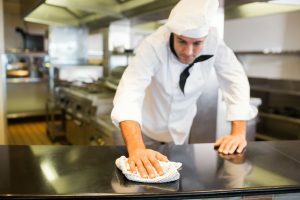 The kitchen is one area that sometimes needs industrial strength residential cleaning services. All the smoke and fumes and soot that go up from your cooking practices can get deposited all around your stove. The constant moisture can also encourage mold growth. If you have to, give it a double sponge-wash. First with a diluted soap solution and follow it up with a water wash. Naps Maintenance can get that last film of unsightly grime off of your walls with their professional cleaning techniques. Winter time can be quite gloomy and cleaning practices can give you some sense of purpose during those quiet, dull afternoons. When going for a jog outside is not possible, a brisk dusting and mopping here and there can prove to be a great exercise alternative. But if it seems to eat up a little too much of your time and you need this time of the year for yourself, you always know the ones at your beck and call.